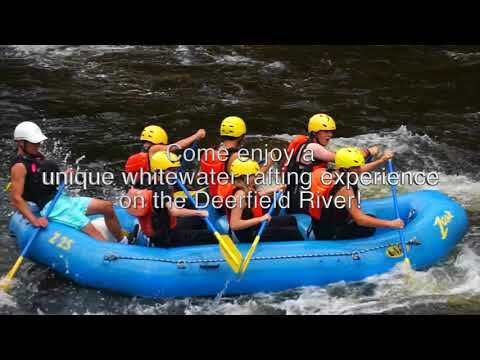 This half-day guided rafting float trip on the Deerfield River is the perfect active recreation to add to your family vacation in New England or to create an adventure getaway with your kids. With a minimum age of 5 allowed on our Zoar family float trips, you can show your children the fun and thrill of rafting as they learn to paddle, perhaps for the first time. Our family rafting trips showcase the beauty of the lower Deerfield River as it meanders through farmland and the rolling Berkshire foothills along the historic Mohawk Trail. Our professional river guides provide insight into the natural and cultural history of the area. With opportunities to swim and splash in the waters of the Deerfield, this trip provides a wonderful afternoon adventure for families, scout and camp groups. Float Trips meet at 2:30 pm and usually finish between 5:30-6:00 pm. Along the way we stop a private swimming hole to enjoy the sun, scenery, and a family friendly snack. We do not use nuts in our food, but cannot guarantee that the ingredients in our meals do not contain nuts or other food allergens. If you have food allergies or other special dietary needs, we strongly suggest you bring your own snack in non-glass containers. Yes! Our photographer will be stationed at the class II rapid taking high quality pictures of each raft. Back at base you'll be able to view your photos in the rafting pavilion. If you'd like, you can purchase the photos of your raft. We generally put 5 to 7 people in a boat, but this doesn’t mean that you need to have a group of 5 to 7 to go rafting. For example, if you’re reserving two people, you may be paired with a party of 4 or 5. If you have a group of 10 people, we would just divide you into two boats of 5 that go out on the water together. We also have two 9-person boats that are sometimes available for this trip. Float trips meet at our base in Charlemont, Massachusetts at 2:30 p.m. Please do not be late, since we must work within the schedule of water releases decided on by the power company. You will be required to read and sign a release of liability at this time. We raft a five-mile class I-II section of the Deerfield River. The entire trip, including snack and swim stops, takes approximately 3 hours, depending on conditions and group size. We run these trips during daylight hours on the water released from the power company's Fife Brook Dam. Occasionally, the power company releases water late in the day or not at all; this is out of our control. Thus, Zoar Outdoor reserves the right to move the trip to another section of the river or a different river, or cancel a trip depending on water releases. For all of our whitewater trips, guests must be able/willing to do the following: Wear a helmet and our personal flotation device (PFD), respond to and follow verbal or visual instruction, roll from front to back in water while wearing a PFD, demonstrate dynamic sitting position (sitting upright), and float with feet up in water. For our Family Float Trip, guests may choose not to paddle. Their paddling is not required.